When did the modern environmental movement begin? Did one event mark its beginning? Earlier this year we commemorated the fiftieth anniversary of Rachel Carson’s Silent Spring, which is often identified as bringing about the environmental movement. While this book’s importance is without question, focusing on it as the birth of environmentalism ignores the importance of urban environmental problems, from unsafe drinking water to severe air pollution, in raising people’s environmental awareness. Ten years before Carson’s book, a great smog blanketed Greater London. From Friday December 5th through to the following Tuesday (Dec 9) 1952, the thick air pollution disrupted daily life and killed thousands of people. 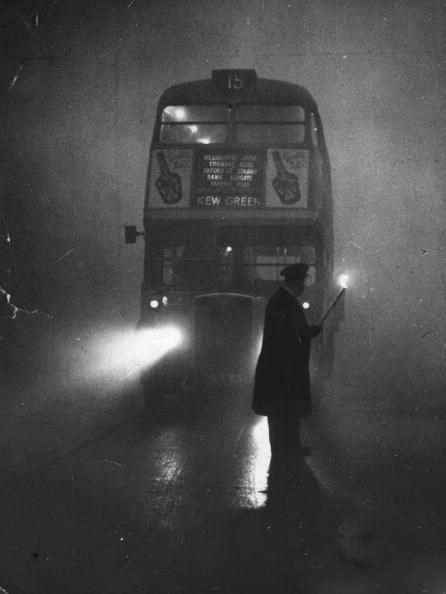 In the aftermath of the Great Smog, the British passed the Clean Air Act (1956). This event, along with other deadly smogs in the United States (Donora), lifeless or burning rivers (Don, Cuyahoga, Thames), and the threat of nuclear radiation (CND), all combined with the ecological knowledge Carson made accessible to a wide public audience, to help make the environment a growing political concern in the post-war era. The process was different between regions and nations, but not completely independent, as the media and publishing industries helped to spread stories about both environmental crises and the ideas within Silent Spring. Industrial cities were already very dirty in the mid-nineteenth century and authors like Charles Dickens described the terrible conditions (see chapter five of Hard Times). One of of the earliest environmental laws, Britain’s 1863 Alkali Act started to restrict some industrial pollution. They also began improving water quality in some rivers during the mid-nineteenth century. Nonetheless, urban and industrial pollution remained a constant problem in European and North American cities through to the mid-twentieth century. Reformers failed to convince governments or the general public that the damage from coal smoke out weighted the jobs and warmth this hydrocarbon provided. In Britain, the Coal Smoke Abatement Society formed in 1898 and it pressured multiple levels of government to address the problem, either through new legislation or by enforcing existing laws. The world wars and economic difficulties of the first half of the twentieth century, however, limited the effectiveness of this organisation. Coal smoke had numerous sources. Regulations had some success with large-scale industries, gas plants and electric generators, by mandating tall chimneys, scrubbers to remove some of the pollution, and efficient furnaces that reduced the amount of soot carried out by the smoke. But there was no simple solution for the other major source of air pollution: the millions of fires used to heat homes across Greater London. These fires were less efficient and generally relied on much shorter chimneys to carry the smoke away. While gas and electric companies promoted the “clean” aspects of their cooking and heating appliances from at least the 1880s onward, most Londoners remained attached to open-hearth coal fires. These fires were seen as healthy because they provided better circulation of air through homes. While coal smoke pollution was a constant problem from the nineteenth century onward, the Great Smog developed into a major crisis, beyond the scale of the regular pea soup smogs. There were two causes, one natural and the other human. In December 1952, an inversion kept five days of smoke in place over London. An inversion is a weather system where the air gets colder closer to the ground. This traps air pollution below a blanket of warm air, preventing it from escaping and expanding into the atmosphere. This natural situation was made worse, because the British were burning a very low grade of coal, called nutty slack. Difficult economic conditions led the government to export the best and cleanest coal. 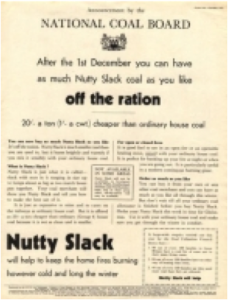 Nonetheless, the new Churchill government wanted to finally lift the coal rations, so they made large quantities of a very low quality and dirty coal, called nutty slack, available to the public. When the Great Smog settled in, the smoke became so dense that it was difficult to walk or drive down the streets. Cattle died in their stalls at the Smithfield Market. The port effectively shutdown, as boats could not navigate on the river. The smoke even infiltrated buildings, exposing London’s population to deadly levels of sulphur dioxide and other pollutants. It was a major event and the smog drew international media attention (Ludington Daily News, New York Times). It was clear at the time that the smog slowed one of the world’s largest cities to a halt and that this had a significant economic consequence. In the weeks and months that followed, the human costs of the smog became increasingly clear (see this 1953 Ottawa Citizen article). By comparing the death rate during and immediately after the smog with pervious years statistics, experts estimated that between four and six thousand people died from the pollution. More recently, some scientists have argued that upwards of twelve thousand people likely died. The number of deaths spiked during the smog, but elevated death rates continued in the days after the smog lifted. Many people continued to die in the aftermath of this exposure. The majority of the death affected the very young, the elderly and people with pre-existing conditions. The collective experience of millions of Londoners, along with the news that thousands of people died, eventually spurred the British government to action. The 1956 Clean Air Act designated “smoke control areas” where residents could only burn smokeless fuels (including coke or gas) for heat. In this way, the Great Smog, centred in London, helped change the way British people heated their homes; it significantly improved the air quality in British cities (though the discovery of natural gas in Scotland also helped clean the air). It made a significant difference in improving the urban environment in British cities. Reflecting on this event in the aftermath of hurricane Sandy, I wonder, is it too optimistic to hope that a similar event that damaged a similar wealthy and politically powerful city might again create the political momentum to get legislators seriously considering climate change? The Great Smog of London, BBC. “Your Memories of the great smog,” The Guardian. Peter Thorsheim, Inventing Pollution: Coal, Smoke, and Culture in Britain Since 1800 (Ohio University Press, 2006). Greater London Authority. 50 Years On: The struggle for air quality in London since the great smog of December 1952 (Dec 2002). Peter Brimblecombe. “Fifty Years on from the Clean Air Act”. School of Environmental Sciences, University of East Anglia. Also see the Great Smog Twitter live Twitter feed from the past five days.